Assisted in junior-level computer architecture course. Investigated multimedia systems, content delivery networks, and Internet caching technologies. Investigated web acceleration, content delivery network, caching, and invalidation technologies. Investigated language design, visual interface, and query processing issues in semantics and content-based image retrieval (SEMCOG). Cambridge University Press, ISBN-10: 0521887399, ISBN-13: 978-0521887397, May 31, 2010. K. Selcuk Candan, Kyung Ryu, Christian S. Jensen, Manish Parashar, Heonyoung Yeom, Partha Kanuparthy, Jong Wook Kim, IEEE International Conference on Cloud Engineering, IC2E 2015, Tempe, AZ, USA, March 9-13, 2015. ISBN 978-1-4799-8218-9. IEEE 2015. K. Selcuk Candan, Sihem Amer-Yahia, Nicole Schweikardt, Vassilis Christophides, Vincent Leroy (Eds.). Proceedings of the Workshops of the EDBT/ICDT 2014 Joint Conference (EDBT/ICDT 2014), Athens, Greece, March 28, 2014. K. Selcuk Candan, Yi Chen, Richard T. Snodgrass, Luis Gravano, Ariel Fuxman (Eds.). Proceedings of the ACM SIGMOD International Conference on Management of Data, SIGMOD 2012 , Scottsdale, AZ, USA, May 20-24, 2012. ACM, ISBN 978-1-4503-1247-9, 2012. K. Selcuk Candan, Sethuraman Panchanathan, Balakrishnan Prabhakaran, Hari Sundaram, Wu-chi Feng, Nicu Sebe (editors). Proceedings of the 19th International Conference on Multimedia 2011, Scottsdale, AZ, USA, November 28 - December 1, ACM, 2011. Divy Agrawal, K. Selcuk Candan, and Wen-Syan Li (editors). New Frontiers in Information and Software as Services: Service and Application Design Challenges in the Cloud, Lecture Notes in Business Information Processing (LNBIP) 74, Springer, ISBN: 978-3-642-19293-7, March 12, 2011. L. Chen, C. Liu, X. Zhang, S. Wang, D. Strasunskas, S.L. Tomassen, J. Rao, W.-S. Li, K. Selcuk Candan, D.K.W. Chiu, Y. Zhuang, C.A. Ellis, and K.-H. Kim (editors). Advances in Web and Network Technologies, and Information Management, Lecture Notes in Computer Science, Springer, ISSN	0302-9743 (Print) 1611-3349 (Online), August 18, 2009. Abdulmotaleb El-Saddik, Son Vuong, Carsten Griwodz, Alberto Del Bimbo, K. Selcuk Candan, and Alejandro Jaimes (chairs). Proceedings of the 16th International Conference on Multimedia 2008, Vancouver, British Columbia, Canada, October 26-31, 2008, ACM 2008. K. Selcuk Candan and Augusto Celentano (eds). Advances in Multimedia Information Systems, Lecture Notes in Computer Science, Vol. 3665., ISBN: 978-3-540-28792-6, 2005. Keith W. Kintigh, Katherine A. Spielmann, Adam Brin, K. Selcuk Candan, Tiffany C. Clark, and Matthew Peeples. Data Integration in the Service of Synthetic Research, Advances in Archaeological Practice, Society for American Archaeology, 2017. Sicong Liu, Silvestro Poccia, K. Selcuk Candan, Gerardo Chowel-Puente, Maria-Luisa Sapino. epiDMS: Data Management and Analytics for Decision-Making From Epidemic Spread Simulation Ensembles, Special Issue of the Journal of Infectious Diseases(JID) on "Big Data for Infectious Disease Surveillance and Modeling", Vol. 214, December 1, 2016. Jung Hyun Kim, K. Selcuk Candan, Maria Luisa Sapino: Locality-sensitive and Re-use Promoting Personalized PageRank Computations. Knowledge and Information Systems, pp 1-39, First online: 18 June 2015. Claudio Schifanella, K. Selcuk Candan, Maria Luisa Sapino. Multiresolution Tensor Decompositions with Mode Hierarchies. ACM Transactions on Knowledge Discovery from Data (TKDD), 8(2), June 2014. Luigi Di Caro, K. Selcuk Candan, Maria Luisa Sapino. PhC:Multi-resolution Visualization and Exploration of Text Corpora with Parallel Hierarchical Coordinates. ACM Transactions on Intelligent Systems and Technology (ACM TIST), 3(2): 22, 2012. Mario Cataldi, K. Selcuk Candan, Maria Luisa Sapino. Narrative-based Taxonomy Distillation for Effective Indexing of Text Collections. Data and Knowledge Engineering, 72: 103-125, 2012. Claudio Schifanella, Maria Luisa Sapino, and K. Selcuk Candan. On Context-Aware Co-Clustering with Metadata Support. Journal of Intelligent Information Systems, 38(1): 209-239, 2012. Mijung Kim and K. Selcuk Candan. SBV-Cut: Vertex-Cut based Graph Partitioning using Structural Balance Vertices. Data & Knowledge Engineering, 72: 285-303, 2012. Yu-Ru Lin, K. Selcuk Candan, Hari Sundaram, Lexing Xie. SCENT: Scalable Compressed Monitoring of Evolving Multi-Relational Social Networks. ACM Transactions on Multimedia Computing, Communications and Applications (ACM TOMCCAP), special issue on "Social Media", 7S, 1, Article 29, November 2011. Luigi Di Caro, Kasim Selcuk Candan, and Maria Luisa Sapino. Navigating within News Collections using Tag-Flakes. Journal of Visual Languages and Computing, 22(2), pp. 120-139, 2011. Jong Wook Kim, K. Selcuk Candan, and Junichi Tatemura. Organization and Tagging of Blog and News Entries based on Content Reuse. Journal of Signal Processing Systems, Volume 58, Issue 3, 2010. Lina Peng, Renwei Yu, K. Selcuk Candan, and Xinxin Wang. Object and Combination Shedding Schemes for Adaptive Media Workflow Execution. IEEE Transactions on Knowledge and Data Engineering, Volume 22 , Issue 1, pp. 105-119, January 2010 . K. Selcuk Candan, Mehmet Donderler, Terri Hedgpeth, Jong Wook Kim, Qing Li, and Maria Luisa Sapino. SEA: Segment-Enrich-Annotate Paradigm for Adapting Digital Content for Improved Accessibility. ACM Transactions on Information Systems, Volume 27, Issue 3, July 2009. Syed Toufeeq Ahmed, K. Selcuk Candan, Sangwoo Han, and Yan Qi. Topic Development Pattern Analysis based Adaptation of Information Spaces. New Review of Hypermedia and Multimedia, Volume 15 Issue 1, April 2009. K. Selcuk Candan, Huiping Cao, Yan Qi, and Maria Luisa Sapino. System Support for Exploration and Expert Feedback in Resolving Conflicts during Integration of Metadata. The International Journal on Very Large Data Bases, Volume 17, Issue 6, pp. 1407-1444, November 2008. Songting Chen, Hua-Gang Li, Junichi Tatemura, Wang-Pin Hsiung, Divyakant Agrawal, K. Selcuk Candan. Scalable Filtering of Multiple Generalized-Tree-Pattern Queries over XML Streams. IEEE Transactions on Knowledge and Data Engineering, 20(12), pp. 1627-1640, 2008. Ping Lin and K. Selcuk Candan. Enabling Access-Privacy for Random Walk based Data Analysis Applications. Special issue of Data and Knowledge Engineering on privacy data management, 63, 3, pp. 667-683, Dec. 2007. Shibo Wu and K. Selcuk Candan. Demand-Scalable Geographic Multicasting in Wireless Sensor Networks. Comput. Commun. 30, 14-15, 2931-2953, Oct. 2007. Shibo Wu and K. Selcuk Candan. Power-Aware Single- and Multipath Geographic Routing in Sensor Networks. Ad Hoc Networks Journal, Volume 5, Issue 7, Pages 974-997, September 2007. Wen-Syan Li, Divyakant Agrawal, K. Selcuk Candan, Yusuf Akca, and Murat Kantarcioglu. Virtual Active Network for Live Streaming Media Delivery. Journal of Interconnection Networks, Vol. 8, No. 1, pp. 45-74, 2007. M.L.Sapino, K.S. Candan, J.W.Kim, and F. Antonelli. Annotating Educational Discussion Boards to Help Students who are Blind. International Journal of Continuing Education and Life-Long Learning. Vol. 17, No.4/5 pp. 294 - 318, 2007. K. Selcuk Candan, Jong Wook Kim, Huan Liu, Reshma Suvarna. Discovering Mappings in Hierarchical Data from Multiple Sources using the Inherent Structure. Journal of Knowledge and Information Systems, 10, 2, 185-210, Aug. 2006. Prakash Yamuna and K.S. Candan. Similarity-based Retrieval of Temporal Documents in Digital Libraries, Multimedia Tools and Applications, 27(1): 143-180, 2005. Ping Lin and K. Selcuk Candan. Hiding Tree Structured Data and Queries from Untrusted Data Stores. Information Systems Security Journal, Volume 14, Issue 4, September, 2005. Christopher B. Mayer, K. Selcuk Candan, and Venkatesh Sangam. Effects of User Request Patterns on a Multimedia Delivery System, pp., 233-251, Multimedia Tools and Applications, December 2004. W.-S. Li, Oliver Po, Wang-Pin Hsiung, K. Selcuk Candan, Divyakant Agrawal: Freshness-driven Adaptive Caching for Dynamic Content Web Sites. Data Knowl. Eng. 47(2): 269-296, 2003. K.S. Candan, W.-S. Li: Reasoning for Web Document Associations and its Applications in Site Map Construction. DKE 43(2): 121-150, 2002. W.-S. Li, W.-P. Hsiung, Oliver Po, K.S. Candan, and D. Agrawal, Evaluations of Architectural Designs and Implementation for Database-Driven Web Sites, DKE 43(2): 151-177, 2002. W.-S. Li, J. Shim, K.S. Candan. WebDB, A System for Querying Semi-structured Data on the Web, Journal of Visual Languages and Computing 13(1), 3-33, 2002. W.-S. Li, K.S. Candan, Q. Vu, and D. Agrawal, Query Relaxation by Structure and Semantics for Retrieval of Logical Web Documents, TKDE 14(4): 768-791, 2002. K.S. Candan, W.-S. Li. On Similarity Measures for Multimedia Database Applications. Knowledge and Information Systems 3(1): 30-51, 2001. W.-S. Li, K.S. Candan, K. Hirata, Y. Hara: Supporting Efficient Multimedia Database Exploration. VLDB Journal 9(4): 312-326, 2001. K.S. Candan, E. Lemar, V.S. Subrahmanian. View Management in Multimedia Databases. VLDB Journal 9(2): 131-153, 2000. K.S. Candan, W.-S. Li, M.L. Priya: Similarity-based Ranking and Query Processing in Multimedia Databases. DKE 35(3): 259-298, 2000. W.-S. Li, K.S. Candan: SEMCOG: A Hybrid Object-based Image and Video Database System and Its Modeling, Language, and Query Processing. TAPOS 5(3): 163-180, 1999. W.-S. Li, K.S. Candan: Integrating Content Search with Structure Analysis for Hypermedia Retrieval and Management. Computing Surveys 31(4es): 13, 1999. K.S. Candan, B. Prabhakaran, and V.S. Subrahmanian. Retrieval Schedules Based on Resource Availability and Flexible Presentation Specifications. ACM-Springer Multimedia Systems Journal, Vol. 6, No. 4, pp. 232-250, 1998. K.S. Candan, B. Prabhakaran, and V.S. Subrahmanian. Collaborative Multimedia Documents: Authoring and Presentation. Special issue of the International Journal of Intelligent Systems on Multimedia Computing Systems, Volume 13(12), 1998. K.S. Candan, V.S. Subrahmanian, and P. Venkat Rangan. Collaborative Multimedia Systems: Synthesis of Media Objects. IEEE Trans. on Knowledge and Data Engineering, Vol. 10, Nr. 3, pp. 433-457, May-June 1998. K.S. Candan, E. Hwang, and V.S. Subrahmanian. An Event-Based Model for Continuous Media Data on Heterogeneous Disk Servers, ACM-Springer Multimedia Systems Journal, Vol. 6, No. 4, pp. 251-270, 1998. W.-S. Li, K.S. Candan, K. Hirata, and Y. Hara. Hierarchical Image Modeling for Object-based Media Retrieval, Data and Knowledge Engineering, Vol:27, Nr:2, pp. 139-176, July 1998. K.S. Candan, J. Grant, and V.S. Subrahmanian. A Unified Treatment of Null Values Using Constraints. Information Systems Journal, Vol. 98, no 1-4, pp. 99-156, May 1997. S. Adali, K.S. Candan, Su-Shing Chen, K. Erol, and V.S. Subrahmanian. Advanced Video Information System: Data Structures and Query Processing. ACM-Springer Multimedia Systems Journal, Vol. 4, pp 172-186, August 96. K. Selcuk Candan, Jong Wook Kim, Parth Nagarkar, Mithila Nagendra, and Renwei Yu. RanKloud: Scalable Multimedia Data Processing in Server Clusters. IEEE Multimedia, Special Issue on Large-Scale Multimedia Retrieval and Mining, 18(1), pp. 64-77, 2011.
Review Board member, the Proceedings of the VLDB Endowment, 2008 - 2010. Special Issue of Mobile Networks and Applications on Ambient Media and Systems. Eds. A. El Saddik, Ben Liang, K. Selcuk Candan, K. Moessner, and J.C. Liu, 13 (6), pp. 543-546, 2008. Special Issue of ACM Transactions on Multimedia Computing, Communications and Applications Journal on the Use of “Context” in Multimedia Information Systems. Eds. K. Selcuk Candan, Augusto Celentano, Wolfgang Klas, Volume 2, Number 3, August 2006. Advances in Multimedia Information Systems, Series: Lecture Notes in Computer Science, Vol. 3665, Eds. K. Selcuk Candan, A. Celentano, ISBN: 978-3-540-28792-6, 2005. Special Issue of Multimedia Systems Journal on Multimedia Information Systems. Eds. K. Selcuk Candan, Wolfgang Klas, 10(1), July 2004. Special Issue of Multimedia Tools and Applications Journal on Multimedia Information Retrieval, Eds. M.A. Nascimento, K. Selcuk Candan, N. Babaguchi, 21(1): 5-7, 2003. 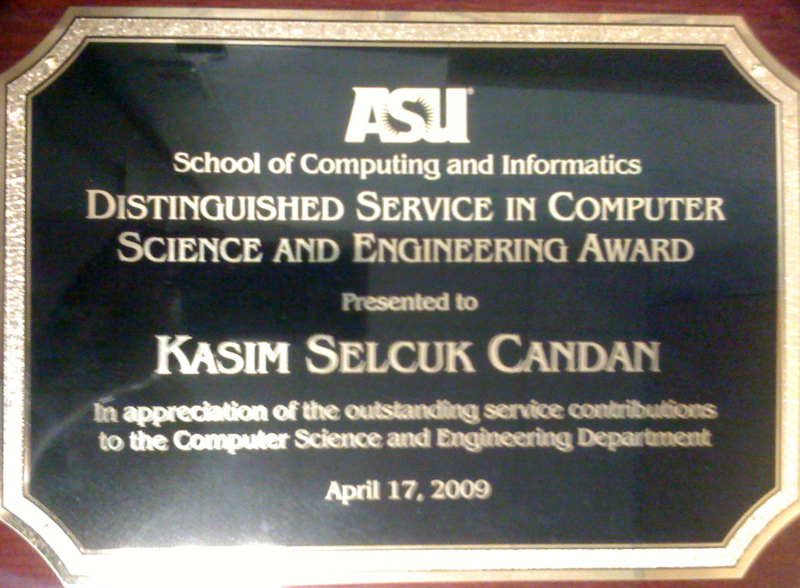 ACM "Distinguished Scientist" Recognition, 2012. ASU Fulton Schools of Engineering. "Exemplar Faculty", (2018-2019). ASU Fulton Schools of Engineering. "Top-5% Faculty Award", 2018. ASU Fulton Schools of Engineering. "Exemplar Faculty", (2015-2016). ASU Fulton Schools of Engineering. "Best Teacher Award", 2015. ASU Fulton Schools of Engineering. "Top-5% Faculty Award", 2014. ASU Fulton Schools of Engineering. "Best Teacher Award", 2013. ASU Fulton Schools of Engineering. "Top-5% Faculty Award", 2012. 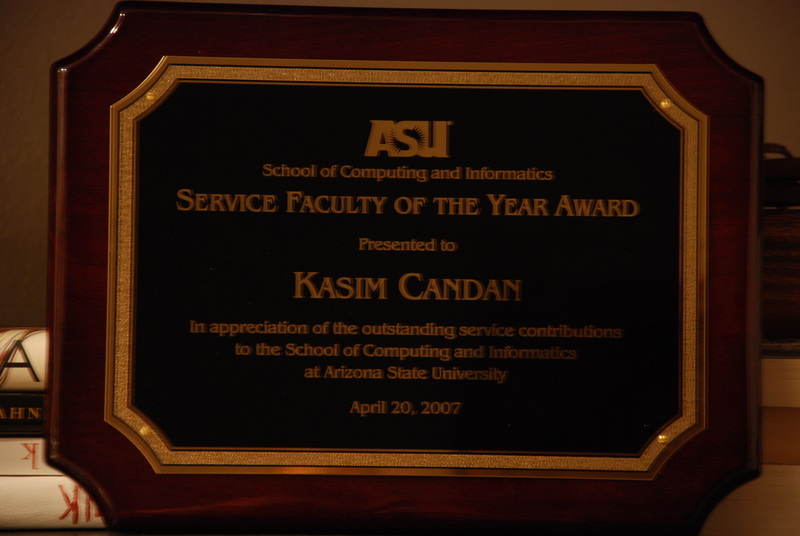 Association for Computing Machinery (ACM) "Recognition of Service Award", 2008. Co-inventor of the CachePortal technology, which received the ”Best of CeBIT America” award in the Enterprise Platform Software category, 2004. 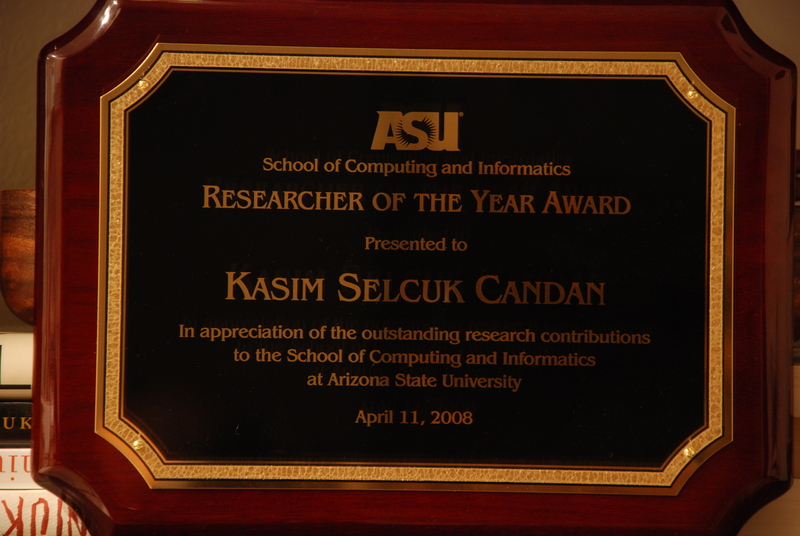 Co-PI of the iCare research group, which received the "Innovator of the Year in Academia" award for Celebration of Innovation, presented by governor of Arizona, 2004. 1997 ACM DC Chapter Samuel N. Alexander Doctoral Fellowship Award for Ph.D. thesis. Scholarship from the Turkish Scientific and Technical Research Institute (TUBITAK) for both undergraduate and graduate studies. NSF DUE#1043583 - "MiNC: NSDL Middleware for Network- and Context-aware Recommendations (PI: Candan, 2010-2014). HP Labs Innovation Research Program (IRP); Data-Quality Aware Middleware for Scalable Data Analysis, (PI: Candan, 2009-2011). Mellon Foundation; Digital Antiquity: Enabling and Enhancing Preservation and Access to Archaeological Information: (PI: Kintigh, 1/1/2009-4/30/2011). Korea Advanced Institute of Science and Technology (KAIST) via Korea Research Foundation; A Framework for Real-time Context Monitoring in Sensor-rich Personal Mobile Environments. (PI: Candan, 2009-2013). NSF Award, AOC: Archaeological Data Integration for the Study of Long-Term Human and Social Dynamics, (PI: Kintigh, 2007-2009). DES/RSA Award, Ubiquitous Environment to Facilitate Access to Textbooks and Related Materials for Adults and School Age children who are Blind or Visually Impaired, (PI: Candan, 2006-2008). Mellon Foundation; Digital Antiquity: Planning a Digital Information Infrastructure for Archaeology, (PI: Kintigh, 2007-2008). ASU-CEINT Award, Indexing in the Physical World across Space, Time, and Human Experience via dense RFID systems, (PI: Sundaram, 2007). NSF Award, Enabling the Study of Long-Term Human and Social Dynamics: A Cyberinfrastructure for Archaeology, (PI: Kintigh, 09/15/2004-09/14/2005). NSF Award, Quality-Adaptive Media-Flow Architectures to Support Sensor Data Management, (PI: Candan, 15/10/03-14/10/06). NSF ITR Medium Award, iLearn: IT-enabled Ubiquitous Access to Educational Opportunities for Blind Individuals, (PI: Panchanthan, 2003-2008). NSF PPD-FRI Award, Ubiquitous Environment to Facilitate Engineering Education for Blind Persons, (PI: Panchanathan, 2003-2005). ARO, International Workshop on Multimedia Information Systems, (PI: Candan, 06/01/02-05/31/03). ASU-IT301, iCARE, (PI: Panchanthan, 2002-2003). NSF Award, Replication of Heterogeneous Multimedia Data, (PI: Candan, 01/01/01-02/31/03). DOD-AFOSR Award, Code Hiding Techniques for Mobile Applications, (PI: Bazzi, 12/01/99-11/30/02). ASU-FGIA, A Distributed Service-provider for Heterogeneous Multimedia Environments, (PI: Candan, 1998). ACM SIGMOD, Conference Co-ordinator, 2012-present. Program Chair, ACM International Conference on Multimedia Retrieval (ICMR) 2019. Parallel and Distributed Data Management and Analytics Track Chair, EuroPar 2018. Finance Chair, Very Large Databases Conference 2019. Sponsorship Chair, IEEE International Conference on Data Engineering (ICDE) 2019. Demos Chair, ACM Conference on Information and Knowledge Management. (CIKM) 2018. Brave New Areas Chair, ACM International Conference on Multimedia Retrieval (ICMR) 2017. Program Chair. International Conference on Database Systems for Advanced Applications (DASFAA) 2017. PC Member, International Conference on Extending Database Technology (EDBT), 2018. PC Member, ACM Multimedia (MM) 2018. PC Member, IEEE International Conference on Multimedia and Expo (ICME), 2018. Senior PC Member, ACM Conference on Information and Knowledge Management. (CIKM) 2018. PC Member, ACM International Conference on Multimedia Retrieval (ICMR) 2018. PC Member, International Conference on Similarity Search and Applications (SISAP), 2018. PC Member, International Workshop on ExploreDB, 2018. Senior PC Member, International Conference on Database Systems for Advanced Applications (DASFAA) 2018. PC Member, ASONAM Conference, 2018. PC Member, International Conference on Multimedia Modelling (MMM) 2018. PC Member, IEEE International Conference on Data Engineering (ICDE) 2018. PhD Symposium Committee Member, IEEE International Conference on Data Engineering (ICDE) 2018. PC Member, International Workshop on Interactive and Spatial Computing (IWISC) 2018. PC Member, International Workshop on Context in Analytics (CIA) 2018. PC Member, Pacific-Asia Conference on Knowledge Discovery and Data Mining (PAKDD) 2018. Demos Chair, ACM Multimedia (MM) 2017. PC Member, AAAI Conference, 2017. PC Member, ASONAM Conference, 2017. PC Member, BigData Conference, 2017. PC Member, DSAA Conference, 2017. PC Member, IEEE International Conference on Data Engineering (ICDE) 2017. Senior PC Member, ACM Conference on Information and Knowledge Management. (CIKM) 2017. PC Member, ACM Multimedia Conference (MM) (Research and PhD Symposium Tracks), 2017. PC Member, ACM International Conference on Multimedia Retrieval, 2017. PC Member, IEEE International Conference on Multimedia and Expo (ICME), 2017. PC Member, International Conference on Multimedia Modelling (MMM) 2017. PC Member, Pacific-Asia Conference on Knowledge Discovery and Data Mining (PAKDD) 2017. PC Member, SIAM International Conference on Data Mining (SDM), 2017. PC Member, International Conference on Similarity Search and Applications (SISAP), 2017. PC Member, ACM Multimedia Systems Conference (MMSys), Demo Track, 2017. PC Member, International Workshop on ExploreDB, 2017. Senior PC Member, ACM Conference on Information and Knowledge Management. (CIKM) 2016. PC Member, Pacific-Asia Conference on Knowledge Discovery and Data Mining (PAKDD) 2016. PC Member, International Conference on Similarity Search and Applications (SISAP), 2016. PC Member, IEEE International Conference on Multimedia and Expo (ICME), 2016. PC Member, SIAM International Conference on Data Mining (SDM), 2016. PC Member, International Conference on Database Systems for Advanced Applications (DASFAA) 2016. PC Member, International Workshop on ExploreDB, 2016. Tutorials Chair, ACM International Conference on Multimedia Retrieval (ICMR) 2016. General Chair, IEEE International Conference on Cloud Engineering (IC2E) 2015. Scholarship Chair, ACM Symposium on Cloud Computing, 2015. History Preservation Chair, ACM Multimedia Conference, 2015. CASCADE I/UCRC Kick-off Workshop (http://www.cascaderesearch.org/cascade-workshop/), November 2015. NSF West Big Data Innovation Spokes Stakeholder Workshop (http://www.cascaderesearch.org/nsfspokes/), December 2015. PC Member; ACM SIGMOD Conference, 2015. PC Member, ACM Conference on Information and Knowledge Management. (CIKM) 2015. PC Member, Pacific-Asia Conference on Knowledge Discovery and Data Mining (PAKDD), 2015. PC Member, International Conference on Database Systems for Advanced Applications (DASFAA), 2015. PC Member, International Conference on Extending Database Technology (EDBT), 2015. PC Member, SIAM International Conference on Data Mining (SDM), 2015. PC Member, International Conference on Similarity Search and Applications (SISAP), 2015. PC Member, IEEE International Conference on Big Data Science and Engineering (BDSE), 2015. PC Member, IEEE International Conference on Big Data and Smart Computing (BigComp), 2015. ACM Multimedia, Best Thesis Selection Committee Member, 2014. Workshops Chair, EDBT/ICDT Conference, 2014. PC Member,Session Chair, International Conference on Extending Database Technology, (EDBT) 2014. PC Member, Session Chair, ACM SIGMOD Conference, 2014. PC Member, IEEE International Conference on Big Data 2013 (IEEE BigData) 2014. PC Member, IEEE International Conference on Multimedia and Expo, (ICME) 2014. PC Member, International Conference on Database Systems for Advanced Applications, (DASFAA) 2014. PC Member, Pacific-Asia Conference on Knowledge Discovery and Data Mining (PAKDD) 2014. PC Member, Italian Symposium on Advanced Database Systems (SEBD) 2014. PC Member, International Conference on Data Management Technologies and Applications (DATA) 2014. PC Member, International Conference on Signal Processing and Multimedia Applications (SIGMAP), 2014. PC Member, IEEE International Conference on Big Data Science and Engineering, (BDSE) 2014. History Preservation Co-Chair, ACM Multimedia Conference, 2013. PC Member, ACM Multimedia Conference (Brand New Topics Track) 2013. PC Member, ACM Conference on Information and Knowledge Management. (CIKM) 2013. PC Member, International Conference on Data Engineering (ICDE) 2013. PC Member, IEEE International Conference on Big Data 2013 (IEEE BigData) 2013. PC Member, International Conference on Signal Processing and Multimedia Applications (SIGMAP), 2013. PC Member, AAAI- Special Track on AI and the Web (AIW) 2013. PC Member, ACM International Conference on Multimedia Retrieval (ICMR), 2013. PC Member, Workshop on Large-Scale Distributed Systems for Information Retrieval (LSDS-IR), 2013. PC Member, International Conference on Advanced Data Mining and Applications (ADMA), 2013. PC Member, SIGKDD Int. Workshop on Multimedia Data Mining (MDM/KDD) 2013. Panels Co-Chair, VLDB Conference, 2012. Publicity Co-Chair, ACM Multimedia Conference, 2012. General Chair, ACM SIGMOD Conference, 2012. General Chair, ACM Multimedia Conference, 2011. Program Group Leader, ACM SIGMOD Conference 2010. Steering Committee Member, SIGKDD Int. Workshop on Multimedia Data Mining (MDM/KDD) 2011-present. PC Member, ACM Multimedia Conference (Brand New Topics Track) 2012. PC Member, ACM Multimedia Conference (PhD Symposium Track) 2012. PC Member, International Conference on Data Engineering (ICDE) 2012. PC Member, International World Wide Web Conference (WWW) Posters track, 2012. PC Member, VLDB Conference, 2012. PC Member, VLDB Conference, 2012 (PhD Workshop). PC member, ACM International Conference on Multimedia Retrieval (ICMR), 2012. PC member, Pacific-Asia Conference on Knowledge Discovery and Data Mining (PAKDD), 2012. PC Member, AAAI- Special Track on AI and the Web (AIW) 2012. PC Member, SIGKDD Int. Workshop on Multimedia Data Mining (MDM/KDD) 2012. PC Member, International Conference on Advanced Data Mining and Applications (ADMA), 2012. PC member, ACM International Conference on Multimedia Retrieval (ICMR), 2011. PC Member, ACM Conference on Information and Knowledge Management. (CIKM) 2011. PC Member, Pacific-Asia Conference on Knowledge Discovery and Data Mining. (PAKDD) 2011. PC Member, AAAI- Special Track on AI and the Web (AIW) 2011. PC Member, Australasian Database Conference (ADC) 2011. PC Member, International Conference on Data Engineering (ICDE) 2011. PC Member,International Workshop on Image Analysis for Multimedia Interactive Services (WIAMIS) 2011. PC Member, International world Wide Web Conference (WWW) Posters track, 2011. PC Member, ACM Fourteenth International Workshop on Data Warehousing and OLAP (DOLAP), 2011. PC Member, SIGKDD Int. Workshop on Multimedia Data Mining (MDM/KDD) 2011. Session Chair, International Conference on Data Engineering (ICDE) 2010. Program Co-Chair, Second IEEE Workshop on Information and Software as a Service (WISS) 2010. PC Co-Chair, ACM International Conference on Image and Video Retrieval (CIVR) 2010. PC Member, International Conference on Data Engineering (ICDE) 2010. PC Member, Australasian Database Conference (ADC) 2010. PC Member, VLDB Conference (Experiments and Analyses) 2010. PC Member, Int.Workshop on Image Analysis for Multimedia Interactive Systems (WIAMIS) 2010. PC Member, The Second Workshop on Management and Mining Of UNcertain Data (MOUND) 2010. PC Member, IEEE International Workshop on Multimedia Signal Processing, 2010. PC Member, International Database Engineering and Applications Symposium (IDEAS) 2010. PC Member, ACM Workshop on Automated Information Extraction in Media Production (AIEMPro) 2010. PC Chair, ACM Multimedia Conference, multimedia tools, end-systems, and applications track, 2008. Workshops Chair, 1st International Conference on Ambient Media and Systems (Ambi-Sys) 2008. Co-Chair, First IEEE Workshop on Information and Software as a Service (WISS) 2009. Co-Chair, APWEB/WAIM'2009 First Workshop on Real-Time Business Intelligence (RTBI) 2009. Co-Chair, ACM Workshop on Ambient Media Computing: Sensory Media Systems and Applications, (AMC-iWAM), 2009. PC Member, World Wide Web Conference, Rich Media Track, 2009. 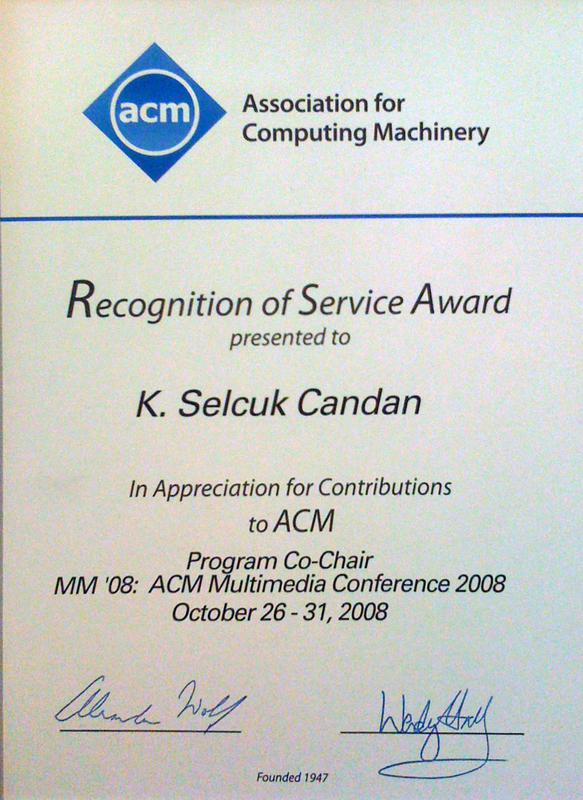 PC Member, ACM Multimedia Conference, 2009. PC Member, IEEE Symposium on Intelligent Agents, 2009. PC Member, 6th International Workshop on Data Management for Sensor Networks, 2009. PC Member, Int.Workshop on Image Analysis for Multimedia Interactive Systems (WIAMIS) 2009. PC Member, Pacific-Asia Conference on Knowledge Discovery and Data Mining (PAKDD) 2009. PC Member, First SIAM SDM Workshop on Multimedia Data Mining 2009. PC Member, International Symposium on Computer and Information Sciences (ISCIS) 2009. PC Member, International Symposium on Ubiquitous Computing Systems (UCS) 2009. PC Member, International Conference on Intelligent Environments (IE) 2008. PC Member, International Conference on Multimedia & Expo (ICME) 2008. PC Member, International Symposium on Computer and Information Sciences (ISCIS) 2008. PC Member, Int. Workshop on Ambient Media Delivery and Interactive Television (AMDIT) 2008. PC Member, SIGKDD Int. Workshop on Multimedia Data Mining (MDM/KDD) 2008. PC Member, VLDB Int. Workshop on Data Management in Sensor Networks (DMSN) 2008. PC Member, Workshop on Software Engineering of Pervasive Services (SEPS) 2008. PC Member, Workshop on Automated Information Extraction in Media Production (AIEMPro) 2008. Co-chair, SIGKDD Int. Workshop on Multimedia Data Mining (MDM/KDD) 2007. Co-chair, 1st ICDE Int. Workshop on Ambient Intelligence, Media, and Sensing (AIMS) 2007. PC Member, International Symposium on Ubiquitous Computing Systems (UCS) 2007. PC Member, International Database Engineering & Applications Symposium 2007. PC Member,	ACM Conference on Information and Knowledge Management, 2006. PC Member, International Conference on Multimedia &Expo , 2006. PC Member, International Conference on Image and Video Retrieval	, 2006. PC Member, Multimedia Data Mining Workshop (MDM/KDD), 2006. PC Member, International VLDB Workshop on Clean Databases (CleanDB), 2006. PC Member, Workshop on	Mobile Location-Aware Sensor Networks, 2006. Reviewer, International Conference on Distributed Computing Systems, 2006. SPIE's Symposium on Voice, Video, and Data Communications, 1998. Member, Evaluation committee for the Projects of the Switzerland National Science Foundation, 2016. Member, Evaluation committee for the Ateneo Projects of the University of Padova, 2015. Fabrizo Antonelli 2005 Co-Advisor. Tesi di Laurea Magistrale. Facolta di Scienze. Universita di Torino. 2005. Eric Arnaduo 2007 Co-Advisor. Tesi di Laurea Magistrale. Facolta di Scienze. Universita di Torino. 2007. Luigi Di Caro 2007 Co-Advisor. Tesi di Laurea Magistrale. Facolta di Scienze. Universita di Torino. 2007 (PhD 2011). Mario Cataldi 2008 Visiting Researcher. Universita di Torino (PhD 2010). Marco Cagna 2009 Co-Advisor. "Estrazione automatica di informazione dal Web: un approccio basato su pattern strutturali e visuali." Tesi di Laurea Magistrale. Facolta di Scienze. Universita di Torino. 2009. Giacomo Cappellari 2013 Supervisor. "Parallel Iteration Fabric: Efficient parallel skyline-window-join computation". Tesi di Laurea Magistrale. Facolta di Ingegneria. Politecnico di Torino. 2013. Ilario Dal Grande 2016 Co-Advisor. Tesi di Laurea Magistrale. Facolta di Scienze. Universita di Torino. 2016. Leonardo Allisio 2015 Co-Advisor. Tesi di Laurea Magistrale. Facolta di Scienze. Universita di Torino. 2015. Silvestro Poccia 2017-2018 PhD Student - Visitor (EU Marie Curie Project). Universita di Torino.